Why do some homes sell in a week while others linger on the market. Is it price alone? Some realtors may have you believe that. Statistics indicate that staged homes will sell quicker and for more. Purchasing a home is an emotional purchase and our specialty is preparing your home so a buyer will fall in love with it. Staging cannot be done partially to be effective. It is a transformation, not just a de-cluttering or re-arranging some furniture. If that emotional feeling is not achieved then there is no sense in doing it. Staging can also include painting, flooring, landscaping and other home improvements. It's difficult for homeowners to accomplish this on their own because they live in the house and have become accustomed to the way things look. An eyesore to a buyer can be a treasured possession to the owner. This is where we can help and it's free with your listing. Click the video to the left for a good summary of how to stage your home. The password is Robert019 (case sensitive). Our preparation and staging report which is included when you list with us, provides detailed recommendations for repairs, painting, improvements and staging specifice to your house. Let's take you on a pictorial adventure of how we can help you sell your home for more money. This home had a lot of worn mismatched furniture. The floors were in excellent shape but the walls and woodwork were painted white so there was no contrasting between the two. The first step was to identify the items to be moved into the garage (de-cluttering). Step 2 was to paint all the walls, leaving the white woodwork intact. 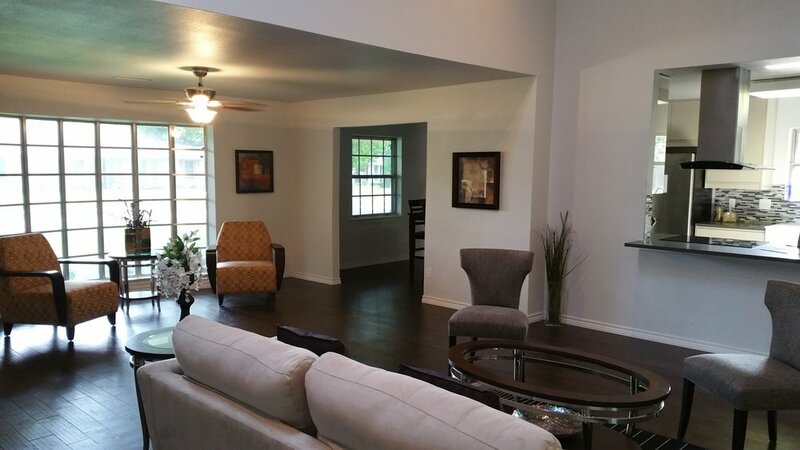 In this after photo you can see the walls were painted with a warm grey to coordinate with the floors. The existing furniture was rearranged and we added one of our chairs to compliment the room. This home had original baths from the 50s but sold in the first 2 weeks and at a great price. The bed and dressers were all squished together and unevenly placed. We re-arranged all the furniture and added one of our small end tables. We also installed inexpensive drapes. The home owner was an artist and we hung many of her are work throughout the home. The rugs were removed to show off the hard wood floors as well as make the room look larger. We also added a bed spread from our stock. The entry way was a mishmash of items. We painted this area with a darker accent color from the same color family as the walls. We hung one of their large mirrors and replaced the large door mat with a smaller warmer one. We also replaced many light switch plates, details matter. 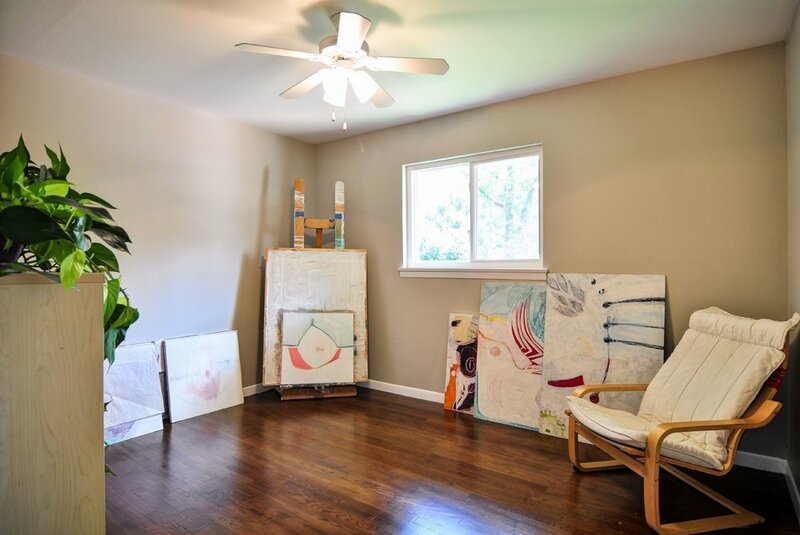 One of the bedrooms was utilized as an art studio. We simply decluttered it and arranged it to be more appealing. Bedrooms in many homes are being used for different purposes. It's important to make them look their best. Although the office was functional it was not appealing. Declutter, declutter, declutter are the main rules. After that the furniture was arranged adding the owners plants for a homey touch. Because there was no back-splash in the kitchen we painted one wall with the accent color as well as the back splash giving it a nice accent to coordinate with the cabinets. Simple decluttering, detailed accessorizing, and the proper arrangement of furniture for full photo effect and accessorizing can go a long way. Professional photography is essential for attracting buyers to view your home. Over 94% of buyers begin their search on the internet before they contact a Realtor. Even when they have a Realtor, they tell the Realtor what homes they want to see based on photos, descriptions, and relevant information. This information is sent to various Consumer Real Estate websites such Zillow, etc. Therefore it is most important that your home is presented in the best possible way with staging and professional photography. Professional photographers use expensive wide-angle lens cameras which combine three exposures into one for light and color balance. 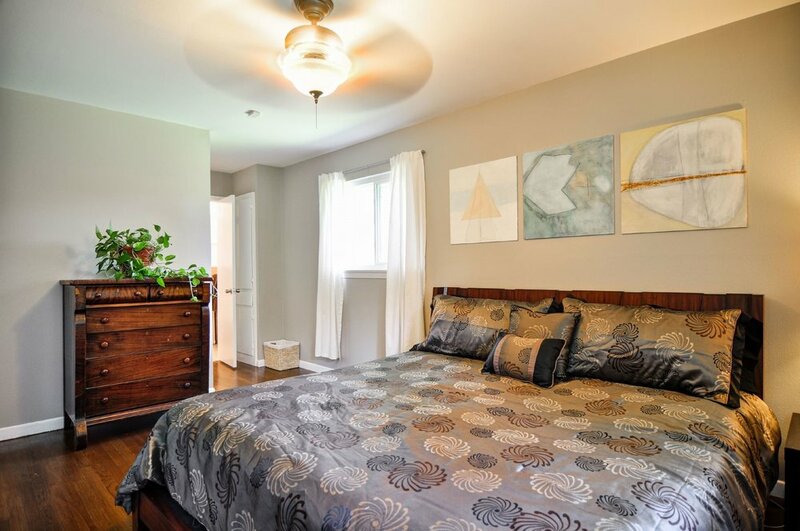 You can see more of the room and more detail with the professional photos. Both photos were taken without a flash and you can see the difference in light balance and color. Below are two more examples. We utilized the seller's own furnishings and accessories. They also painted from when they had purchased the home. In a vacant home it is hard for a potential buyer to place their furniture and imagine themselves living in the home. They wonder if their bed will fit, where to put the couch, etc. A staged home allows the buyer's imagination to place their own furniture in the home and determine rough spacing. Even if their furniture is not the same size they start to move it around in their head. I've often heard a couple talking together about where they would put things. If this happens you know they are interested. Sometimes doing minimal remodeling can make a big difference. In this example the homeowner realized about $40K more on the sale. Materials & Color Selections - We have trained and experienced in selecting the selling colors, materials, fixtures and accessories to appeal to the broadest number of buyers. Detailed Home Preparation Report – We conduct a detailed visual evaluation of your home and prepare a written report including repairs, possible inspection problems and improvements specifically designed to sell your home. The recommendations are prioritized so that you may choose to complete all the suggestions or pick and choose which ones fit your time and budget. We also have a list of repair people and vendors that can help at very reasonable rates. Staging can be as simple as de-cluttering, cleaning, rearranging furniture, and accessorizing. It can also include painting, window coverings, landscaping and other home improvements. Since you will be moving soon, Rob will help de-clutter by identifying items that could be packed into boxes now. He will also identify excess furniture to be removed, opening rooms and making them look larger and more inviting. We actually stage your home with your own furnishings and/or with items, accessories and art from our own inventory when available. The goal is to create an environment that appeals to the majority of buyers by enhancing positive features and reducing any negative aspects of the property. Painting – Painting is probably the least expensive way to make an immediate impression on potential buyers. Rob knows what the selling colors are and will suggest an appropriate neutral color scheme that fits the style of your home. Rob has a list of reasonable dry wall and paint tradesman. Carpet – Carpet is the second least expensive way to make a lasting impression. Rob can also refer a reasonable carpet installer below Home Depot prices. Remodeling – Some of our clients decide they want to do some major home improvements to the kitchen and or baths in order to increase the value of their home. Before you remodel we can recommend what type of investment will return the most for your dollar. We have helped many of our clients by providing the proper design recommendations and coordinating vendors.